Star Wars is in everyone’s brains as we steadily approach the latest installment in the saga. Tabletop games are selling out like crazy, including one of our favorites, Star Wars: Rebellion. While we can talk more about the great products of Fantasy Flight Games, let us not forget the games of decades past. A long time ago, before the new trilogy (and even the prequels), we had our own ways to explore a galaxy far, far away. Although several games came out the year Star Wars premiered, most remember this lovely submission from Kenner. A simple game, each player controlled a squadron of X-Wings as they attempted to get past turrets, TIE Fighters, and into the trench. With a rotating central board, combats, and “life points” (in the form of your 3-ship squadron), this old-school game had some advanced ideas. Still, like most 70’s spinner-based games, this was mostly a fancy version of Chutes N’ Ladders suitable for kids. Kenner and others only tried a few more board games during the Empire Strikes Back era. The “best” (if you could call it that) was a lovely journey across the icy planet of Hoth. Another spinner-based game, this one included an almost RPG-like quality, where you built up cards through encounters. Like a cheap Talisman, only once you’d acquired everything necessary could you enter the central area and attempt to defeat Darth Vader. This game was an all-time favorite of my youth, if only because you could push the pawns off the sail barge and watch them fall into the sarlacc’s mouth. Bonus points because the 3-D cardboard could also be used to play with my small Star Wars mini figures! A simple cooperative game, you played cards for movement and (if next to an enemy) flipped the top card to see if you knocked them off. Only once you’d done that to everyone, including Boba Fett and Nikto, could you try to take out Jabba. The person who defeated the most points of enemies wins! For the most part, Star Wars games during the original trilogy were children’s games or variants of war and board games. Years after the movies ended, West End Games gave us the first tabletop RPG, and the fandom changed. WEG’s roleplaying game was a primary force behind the Expanded Universe, with their lore filling in much of what the movies didn’t give us. Their supplements were considered canon so much they laid the foundation for Timothy Zahn’s Heir to the Empire series, the original sequels to the movie. A great system that used 6-sided dice, this RPG may not have been the most balanced, but it emulated the cinematic nature of the films. The system was revised and further expanded, including a hex-based wargame for starfighter dogfights and a miniatures wargame for ground battles. With the rise of Magic: the Gathering, it seemed like every franchise had its own CCG. Things were no different for Star Wars when Decipher put out their own variation. Like most CCGs, you constructed a deck from randomized packs with which you battled your opponent. “Life Force” was lost as characters and vehicles were destroyed, while new locations granted you extra life. One difference was that players had to choose either Rebellion or Empire – the game wasn’t initially intended for anyone to play whatever “side” they wanted. Still, there was a lot of variety and tactics, and the game lasted far beyond when it was officially printed. With the advent of home video technology, “interactive” games began to spring up in the late-90’s. Parker Brothers provided their take that combined a board game with a VCR tape, where players used the game while reacting to the video. While somewhat simple in its design, the game was relatively tricky at times. 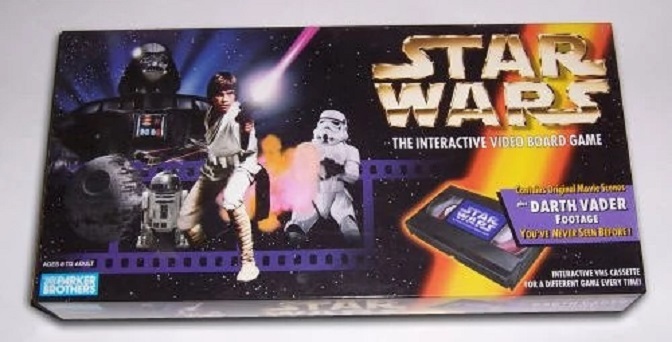 You had to play in real-time with the video, moving as fast as you could toward objectives while being taunted by Darth Vader. Eventually, one player would be swayed to the Dark Side and would work against you. If you didn’t succeed before the tape was finished? Everything blew up, and you lost. The start of the 21st century was not only the time of the prequels but also the era of the D20 boom. Wizards of the Coast used its acquisition of TSR to adapt Dungeon & Dragon’s system to everything, including a new Star Wars RPG. Although a lot of fun and a great intro to RPGs for newer players, a lot of the cinematic feel was lost. WotC’s version was mainly a reskinned D&D in space, which was nothing new. Still, the ability to codify all the material (including the prequels) made this a staple on many gamers’ shelves. Wizards would release a Saga Edition well after the Prequels had ended, that helped streamline the system’s problems. This version also included many great supplements on the Expanded Universe, allowing players to explore everything from the Old Republic to the Legacy Era. Like WEG before them, WotC would also include a miniatures game that could be played alone or to supplement the RPG. Probably one of the most complex board games produced for Star Wars, Avalon Hill tried to emulate four different battles at one time. Over 150 miniatures and three boards (one of which had multiple levels) led players through the significant sequences at the end of The Phantom Menace. Players draw and choose action cards at the same time and arrange them sequentially to determine what happens that round. Individual dice and alternating turns then decide the consequences of the various battles and in each order. The great thing about this game is that you needed to prioritize which arena was more important. Failing in the wrong one could have dire consequences and lead to a loss for your side. Milton Bradley had a fascinating take on the “what if” concept when they made a game where you could make all the favorite characters fight each other. Anakin versus Han Solo, Boba Fett versus Palpatine, it was up to you what you wanted to see. A self-contained game, it provided unique decks for a variety of characters, each with their powers and strengths. Your choice would come with support characters, and you’d battle them in different arenas, to see who made it out alive. Epic Duels was probably the last decent tabletop game outside expansions to those above and any “Star Wars” variants of popular games (like Risk or Monopoly). Now that we’ve taken this jaunt down memory lane and named our favorite Star Wars games from decades ago, it’s your turn. Did we miss any of yours? What did you play a long time ago?